I still remember when I first heard from Blake and Maira – who were still out in the jungle shooting the project that would become Songs of the Vine. I was very happy to see it accepted into the festival as I had just been reading The Cosmic Serpent – a study of ayahuasca and its history in the ancient cultures of South America. I was excited about the opportunity to ask some questions of these intrepid storytellers whose interests intersected my own in sacred ritual and spherical photography and its power to create a palpable sense of presence. FIVARS: Tell us about the journey that led you to this subject? 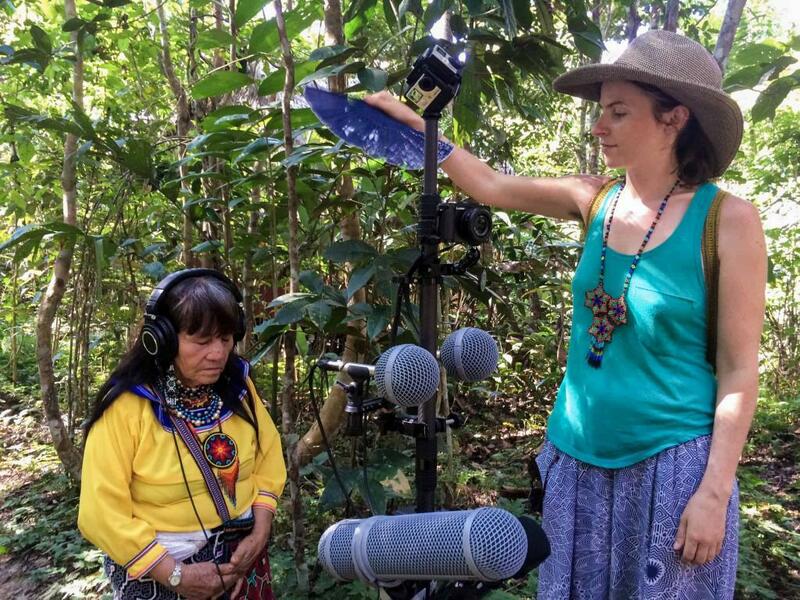 Maira and Blake (directors of Songs of the Vine): The journey began in 2014 when Maira’s sister first visited the Temple of the Way of Light, a world-class ayahuasca healing center located in the Amazon Rainforest outside of Iquitos, Peru. After her profoundly positive experience, she returned to the Temple in 2015 with Maira, who underwent a similarly transformative and healing experience. 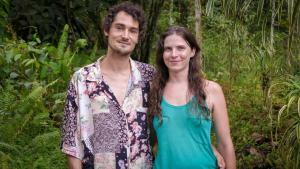 Maira then introduced Blake to ayahuasca when the two of us returned to the Temple in January 2016. After Blake experienced the medicine himself, together we decided to pitch a multimedia project to the Temple, which included a series of virtual reality films focusing on the traditional healing modalities of the Shipibo (an indigenous group native to the Peruvian Amazon who’ve been working spiritually and medicinally with ayahuasca for centuries). After they accepted our project proposal, we returned in the summer of 2016 and spent ten weeks living in the jungle, regularly participating in ayahuasca ceremonies, filming educational VR videos, and recording an album of the Shipibo curanderos’ (healers) ikaros (medicine songs). FIVARS: Have you tried the ceremony yourself? Previous to filming this project, we had both visited the Temple as guests seeking healing, and participated in a number of Shipibo-led ayahuasca ceremonies. Our experiences in ceremony inspired us to propose this project and build a new platform to spread the message of the medicinal power of ayahuasca. When we returned to film in the summer of 2016, we participated in ceremonies weekly. Our personal transformations with ayahuasca, under the invaluable guidance of master Shipibo curanderos, deeply informed the mission and process of the projects we’d been commissioned to create at the Temple. FIVARS: Do you see a correlation between psychotropics and VR as a phenomenon in the culture? Many believe entheogens have been a part of human culture since before recorded history, so we don’t see their use as a current “phenomenon,” just a continuation or evolution of their role in society. However, there is definitely a correlation between the states of consciousness that VR and psychedelics can induce, in a sense that both can enable shifts in perspective that can radically alter an individual’s perception of themselves and the world around them. In some respects, the psychedelic state of consciousness induced by ayahuasca and other entheogens can be thought of as an advanced, neurochemically activated augmented reality, which pre-dates human technological advancements in virtual and augmented reality by hundreds, if not thousands, of years. In this way, humanity has a tremendous amount to learn from the plant kingdom about augmenting human consciousness and perception to facilitate personal and spiritual growth. FIVARS: What is your background in documentary, filmmaking, storytelling and/or spherical video? Maira’s background is in sound design, acousmatic music composition, animation, and multimedia video art. Blake has been working in the VR filmmaking space since early 2015. 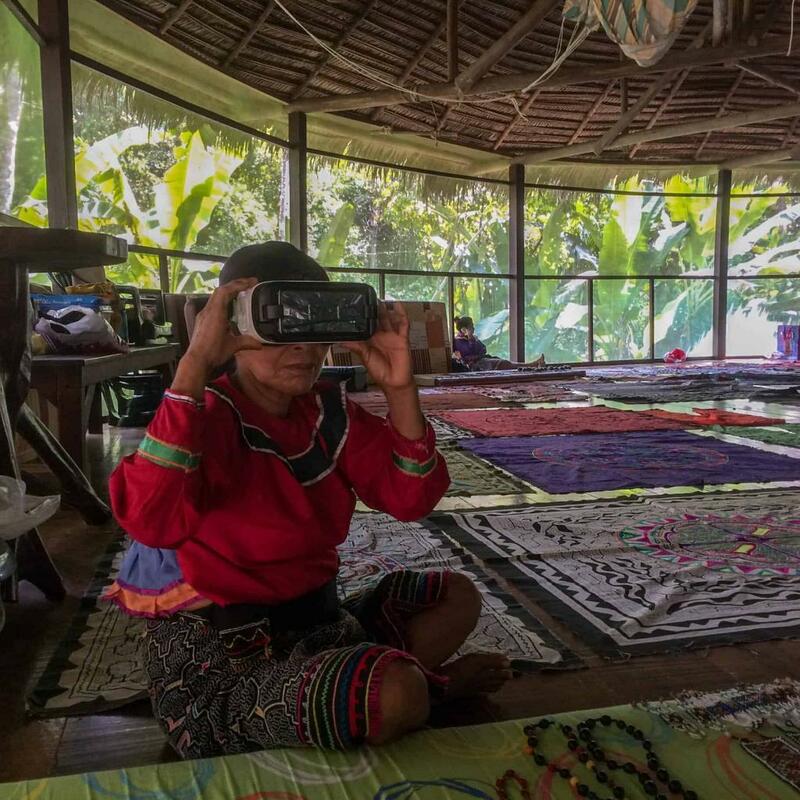 We felt that VR was an especially fitting and powerful medium to immerse viewers in the Amazon Rainforest, to learn about ayahuasca from Shipibo curanderos and experience their medicine songs. Making Songs of the Vine was one of the most meaningful experiences of our lives, largely because it was inextricably intertwined with very personal and transformative healing processes that we underwent over the ten weeks we spent together living and working in the Upper Peruvian Amazon. It was also an extremely challenging experience, as we took on all the roles and responsibilities of a very ambitious and technologically intensive project, while also embarking on spiritual journeys that transcended the day-to-day work we had been commissioned to do. We literally put our sweat, tears, and vomit into making Songs of the Vine – and grew so much in the process. There was something strangely dichotomous about crafting a film about such ancient and natural forces with cutting-edge technology, but somehow, we managed to find a balance in the creative process, and miraculously, all of our equipment survived two and a half months in the extreme conditions of the Amazon Rainforest. Since returning to the Bay Area last September, we’ve been working together through the post-production process. Blake focused mainly on the visual side of the project, working through the stitching and color correction, while Maira focused more on sound design and mixing the multitude of audio recordings she captured. However, we very much shaped the film together through the editing process, and continually refined the film until it became the final piece that it is today. FIVARS Runs Sept 15th-17th at House of VR in Toronto, Canada. Get ticket now.